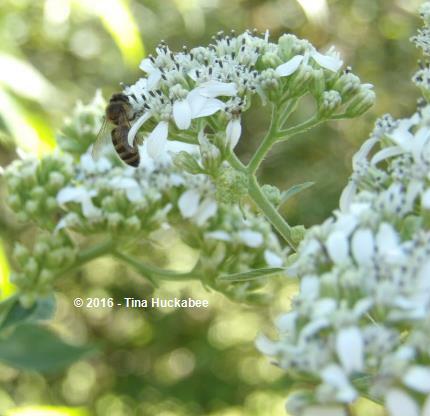 It’s seldom frosty here in temperate Austin, Texas, but when Frostweed, Verbesina virginica, graces a garden, it beautifies with icy-white, frothy flowers from late summer through autumn. 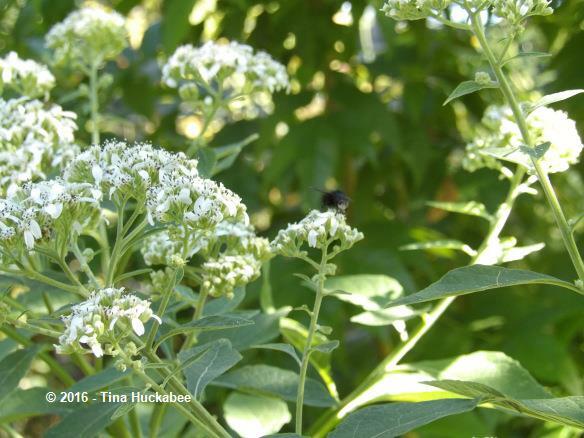 A native North American herbaceous perennial, Frostweed is a great plant to profile for A Seasonal Look, because it’s lovely, interesting, and home gardeners, as well as visiting pollinators and birds, should enjoy this plant. 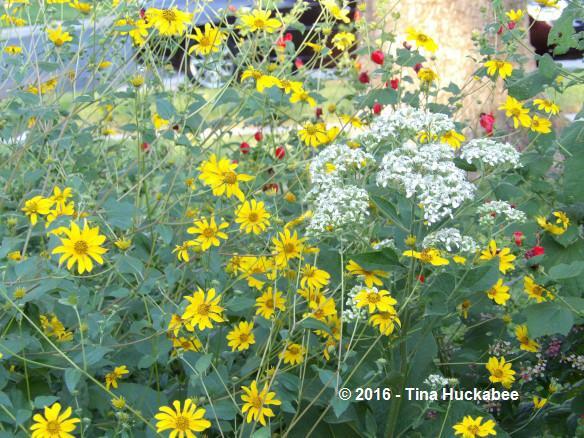 The most common of the common names for V. virginica is Frostweed, but according to the LBJ Wildflower Center, it also goes by the names White Crownbeard, Iceplant, Iceweed, Virginia Crownbeard, Indian Tobacco, Richweed and Squaweed. 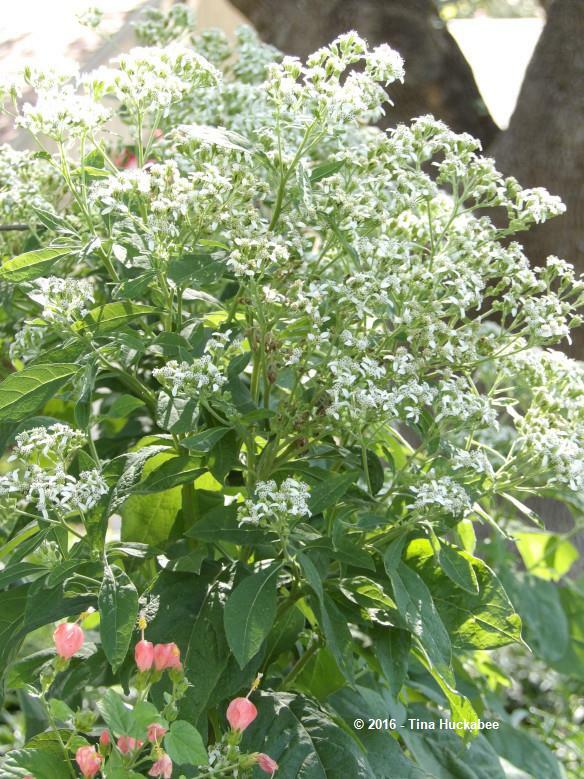 While I don’t know this for certain, I’m guessing that the Crownbeard variations might refer to the clusters of lovely autumn blooms that V. virginica displays. 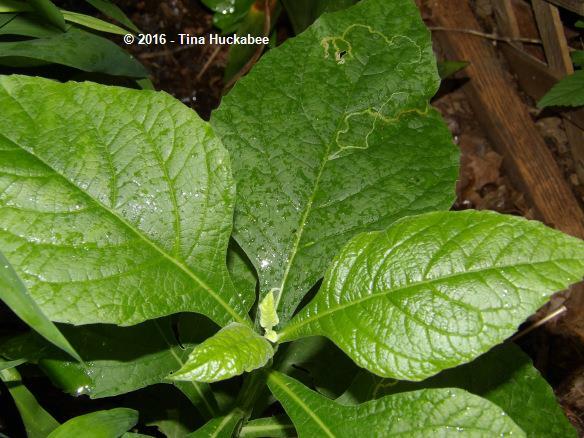 Additionally, Frostweed leaves provided a tobacco source for some Native Americans, which presumably gave rise to those last two common names. 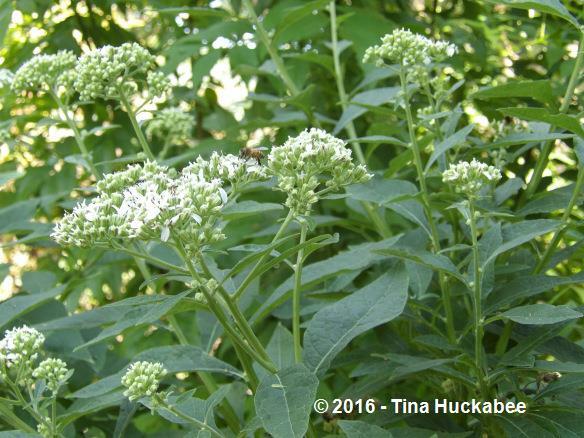 On a healthier note, Frostweed was also traditionally used as a fixative for gastrointestinal issues, urinary, and eye problems. I like it because it’s pretty and tough and a great wildlife plant. As for the various names suggesting more frigid attributes, those names are not referring to the cool white of the flowers, but instead to an unusual process that occurs with this plant early in winter, at the first hard freeze. 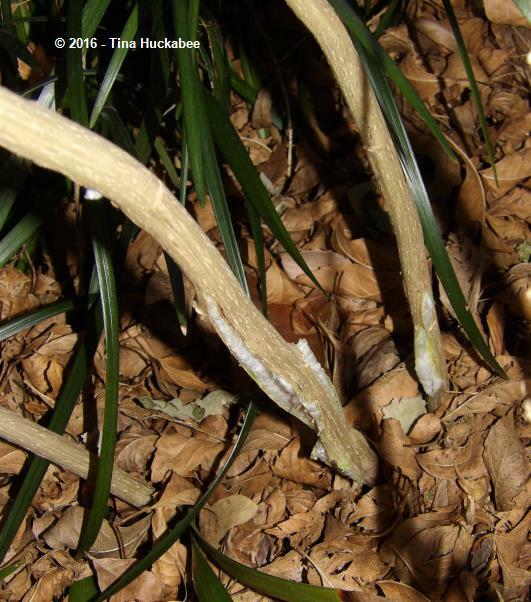 As the temperature plummets , sap in the trunk cools and expands, eventually breaking through the epidermis of the plant. 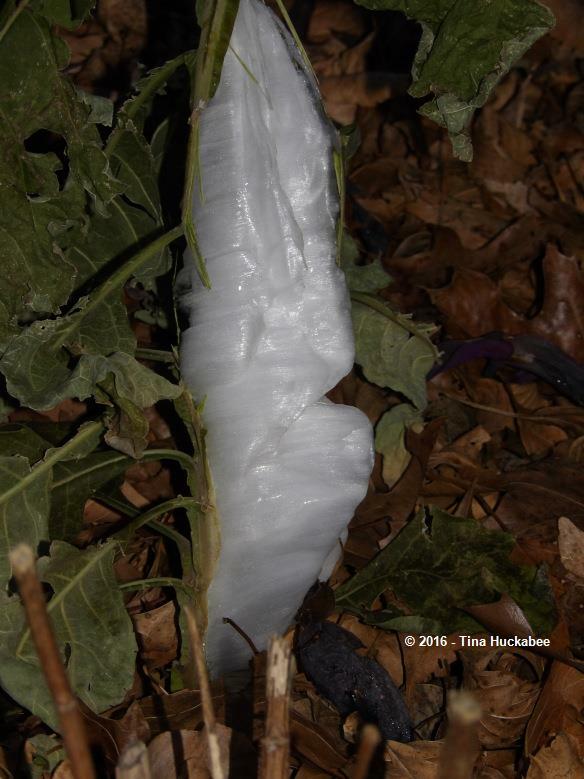 The sap hits the freezing air, solidifies in thin sheets, moving up along the vertical structure of the plant. The ice sculptures freeze in a ribbon-like design. Conditions for this awesome display are particular: the ground must be moist, assuring the roots are actively drawing water into the plant. Also, the temperature drop must be relatively rapid. The ice ribbons are fragile and thin, melting at the touch or quickly by air once temperatures rise above freezing. 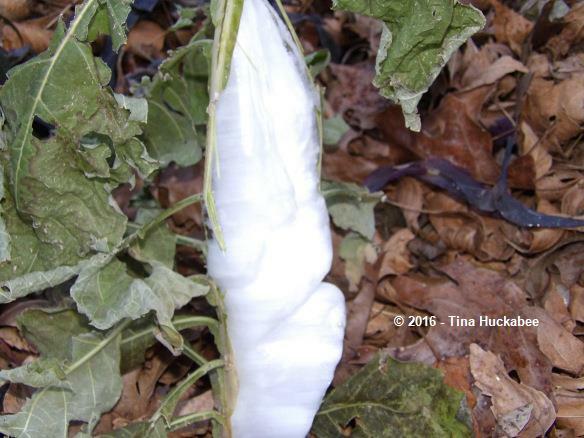 The Frostweed ice extravaganza is an ephemeral event. Not many plants ice dance this beautifully, but Frostweed is one that does. If you’d like to see more wavy-groovy Frostweed ice sculptures, click on the LBJ Wildflower Center’s Frostweed, 68 photo(s) available in the Image Gallery. 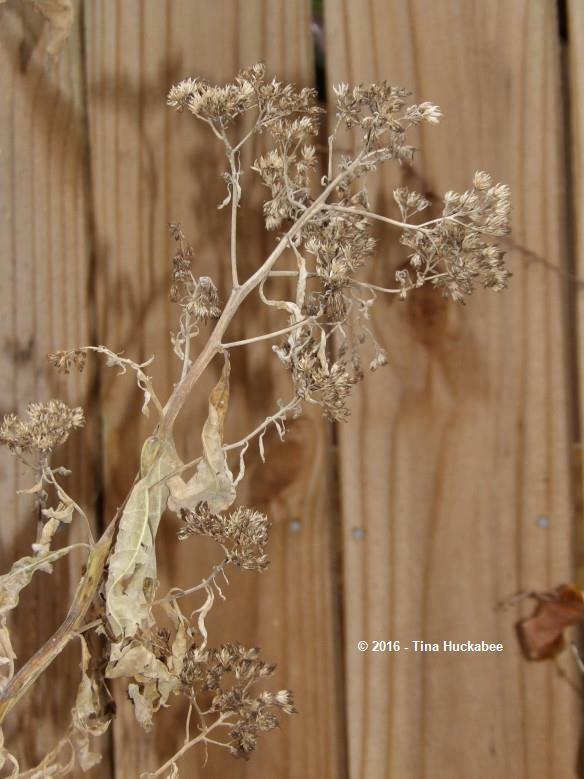 Once a hard freeze occurs and Frostweed concludes its frozen display for the year, the plant is rendered dormant. I don’t necessarily prune my plants at that point, but one can–it’s a matter of your aesthetics and time. 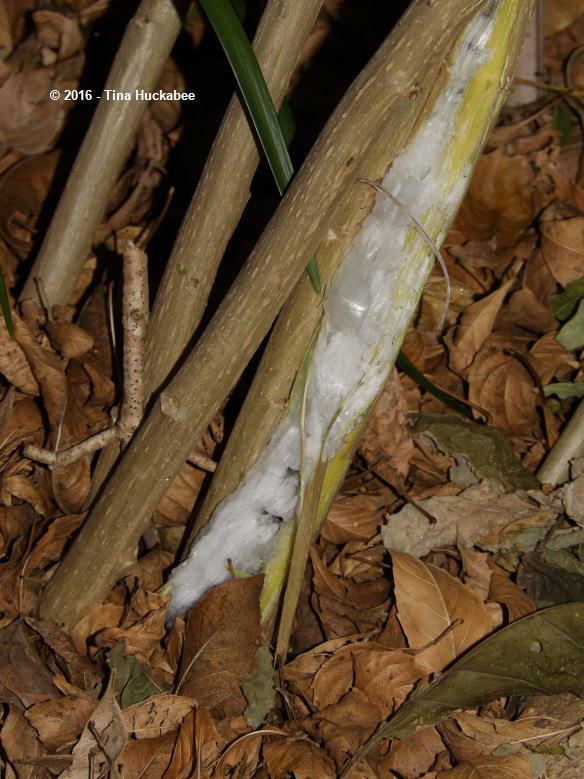 Some winters are mild and in those conditions, Frostweed doesn’t produce ice sculptures, but the plant will become dormant, or mostly so, even with a light frost. 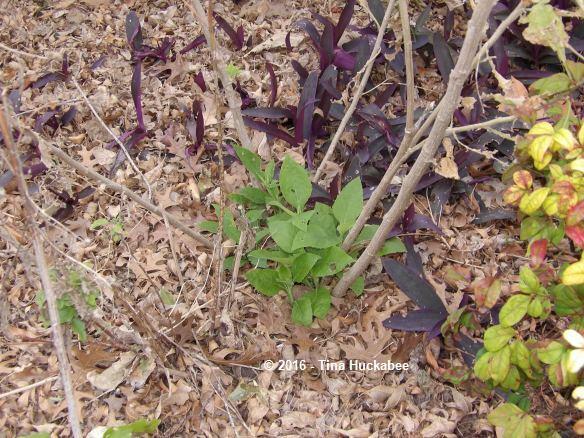 Additionally, in mild winters even after Frostweed is dormant, new growth can appear from the ground when temperatures are warm enough, well before calendar springtime. 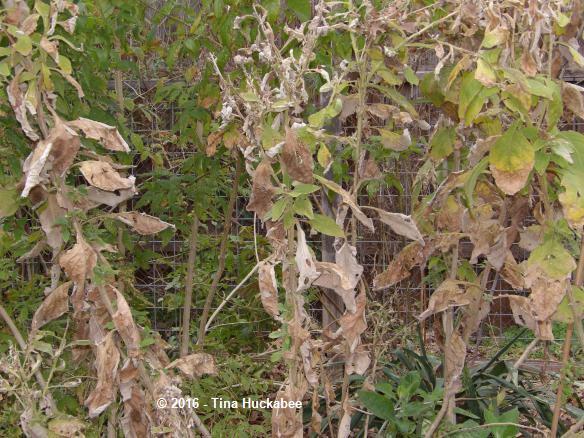 That’s always tricky because if a late hard freeze occurs, the Frostweed will die back again. 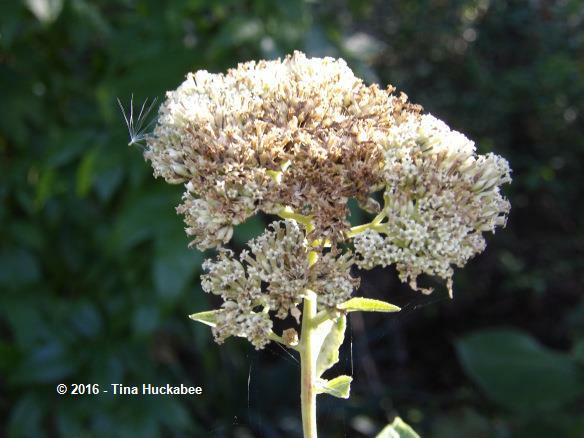 An established Frostweed plant is robust enough to overcome that shock, but new plants might succumb. 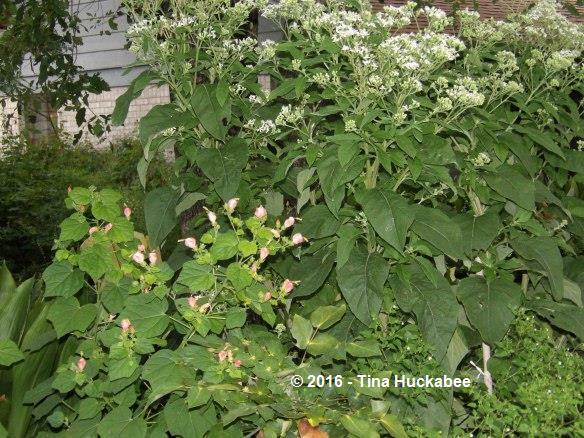 So, the stalwart gardener rolls up his or her sleeves and plants more Frostweed. Newly emerged foliage is exuberant and verdant, but like others in the Asteraceae (Aster) family of plants, Frostweed’s leaves are sandpaper rough. The leaves are also a bit awkward because they’re also quite large, even those on the new spring plants. 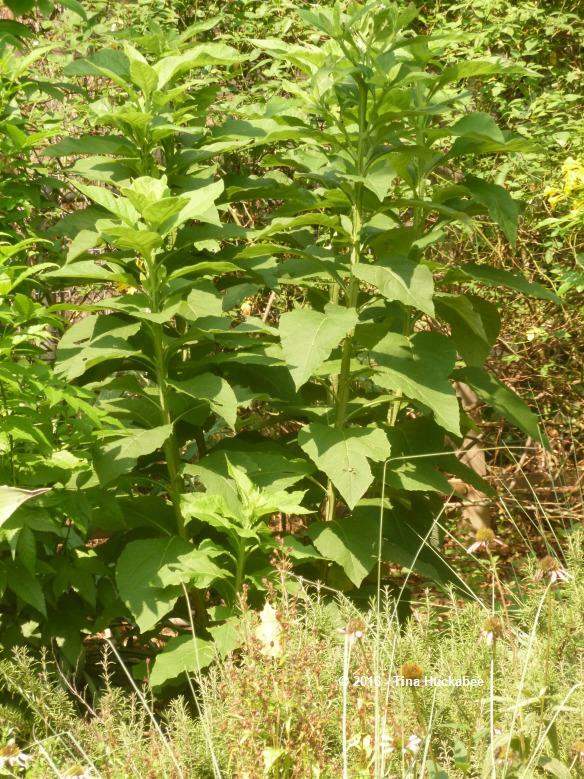 Frostweed is the plant version of a puppy with large paws. I like the showy, scrappy foliage. 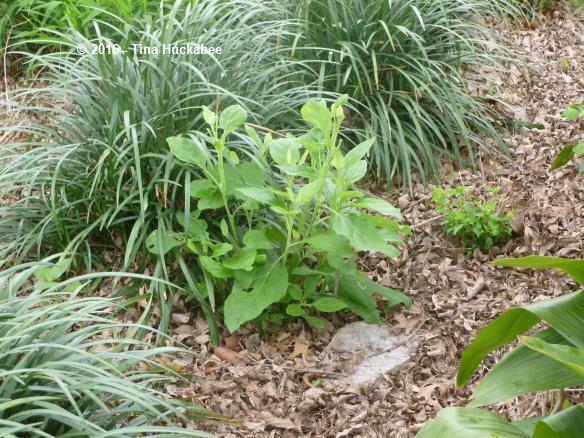 I plant my Frostweed with complementary fine or small leafed shrubs and grasses, and also mix it with evergreens (when possible), since Frostweed itself is pruned back in winter. 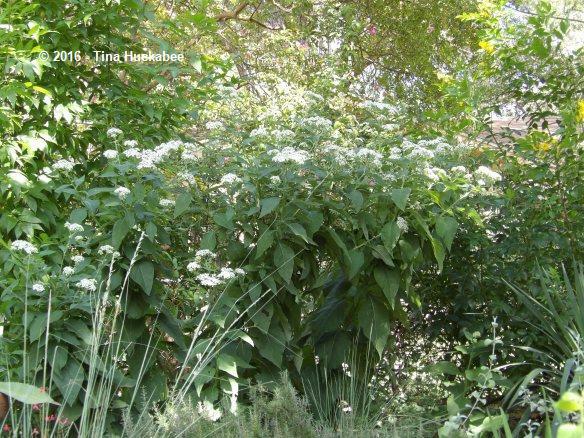 Throughout the late spring and summer months, Frostweed grows and the plant eventually catches up to the leaf size. The puppy grows into its feet. 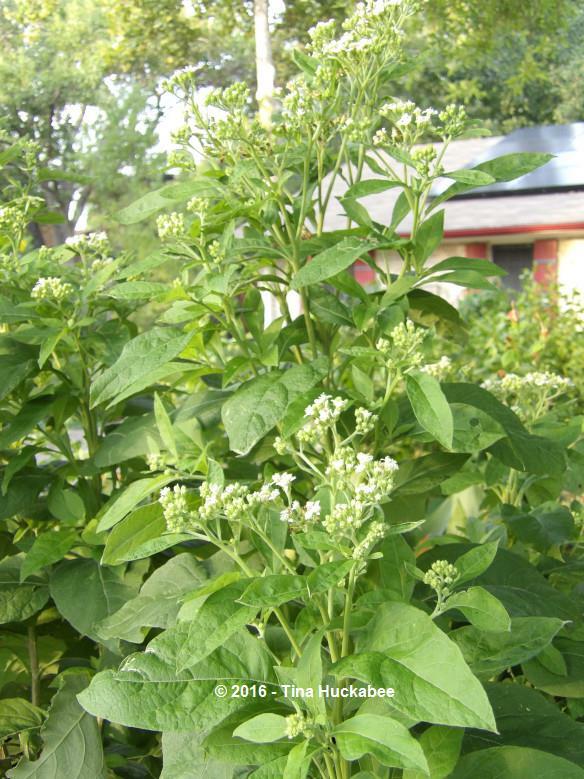 Frostweed’s height ranges from 3 feet to about 6 feet, depending upon soil, sun, and moisture. 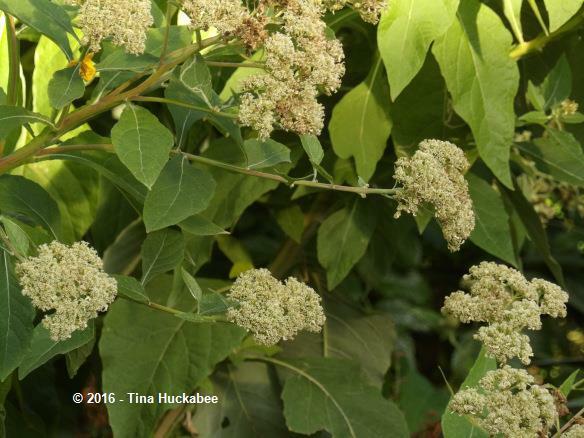 It’s a woodland plant and considered an understory, so it grows and blooms well in shade–with or without extra watering. It’s an excellent dry-shade plant. Some of my Frostweed get a reasonable amount of afternoon (Texas!!) summer sun and those specimens tend to grow to about 6 feet. Some years (depending upon rainfall) I stake with rebar because at the first heavy fall rains, Frostweed can flop a bit and I prefer their stand-at-attention persona. By early August, here in Central Texas, regardless of whether it’s been a dry or a wet (hah!) summer, Frostweed flowering begins. At first, a tiny bit of bloom. It can take 6-8 weeks from those emergent blooms for the whole set of flowers to burst forward in full cauliflower-style glory, but when they do, stand back and enjoy. 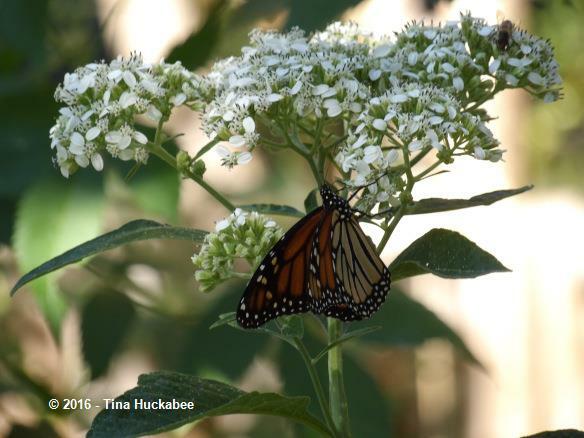 A favorite of many pollinators, Frostweed’s blooms are timed for the autumn Monarch migration. 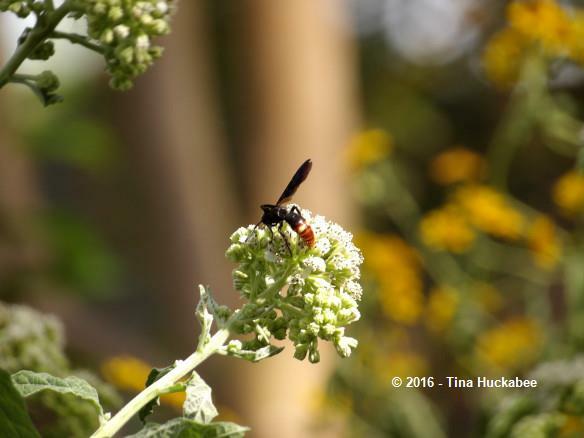 This Tachnid fly is one that I never see–except when Frostweed blooms. 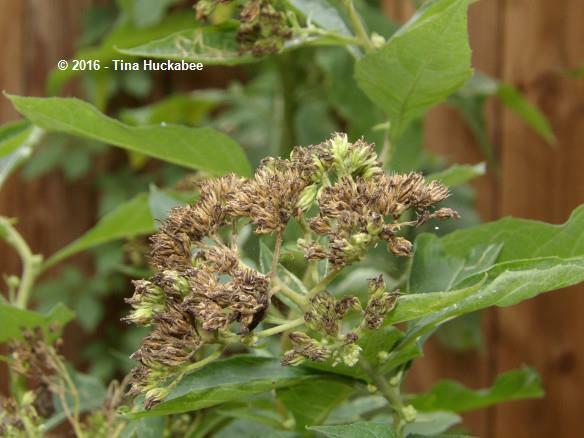 At this point in late autumn, seed development is well underway; finches and warblers are present and snitch Frostweed seeds from time-to-time. Still, there are plenty of seeds that drop, germinate, and produce seedlings for the next growing season–either to give away or to transplant to other places. 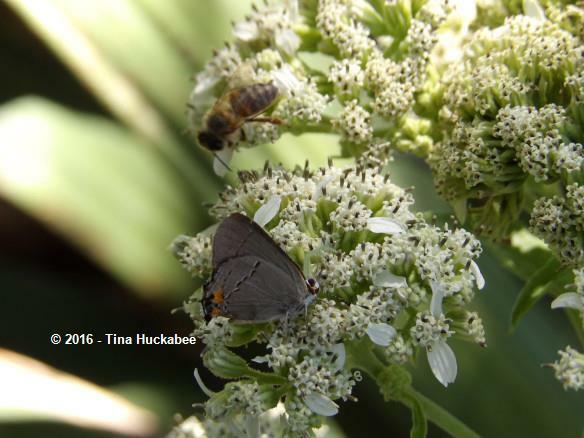 Overall, I think that Frostweed is a superb insect nectar source, but it’s also a fair seed provider for the avian set and for future Frostweed production. 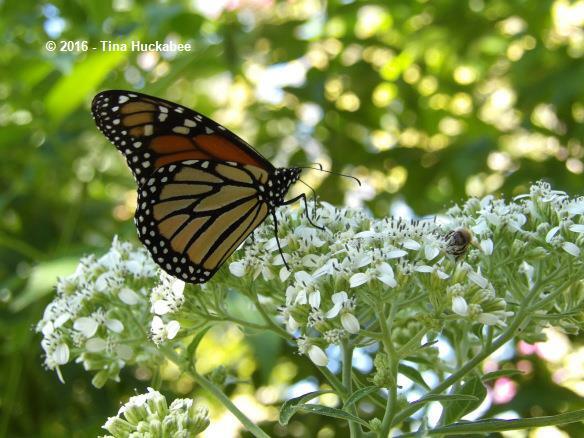 In short, Frostweed is a great wildlife plant addition to any garden. 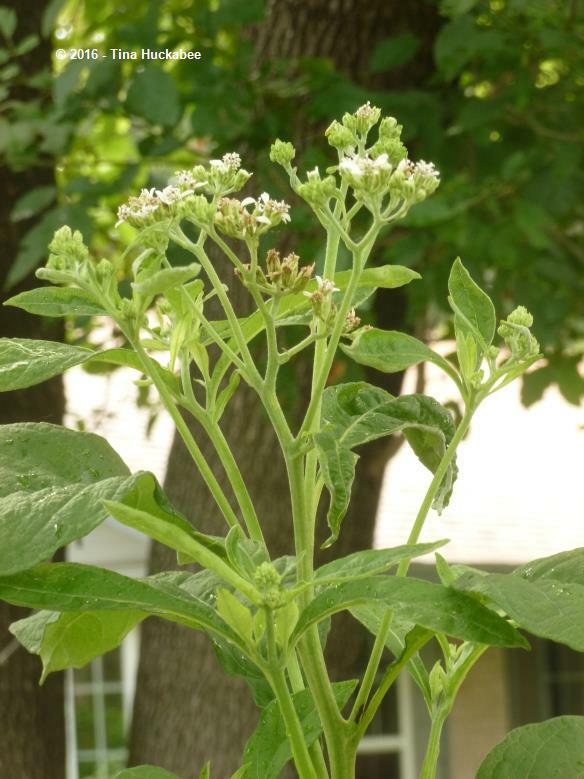 Frostweed is found throughout a large area of North America, from Texas to the deep South and northwards to the mid-states of the US. 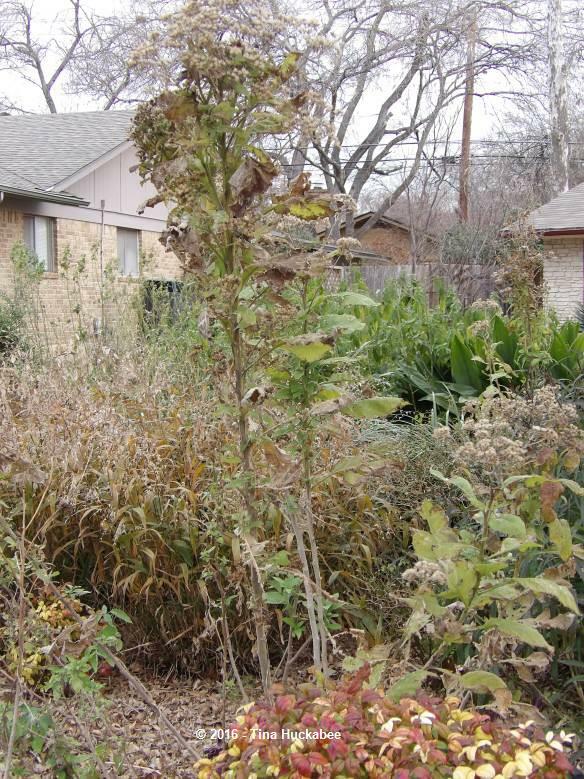 I would imagine that in the areas where freezes are a sure thing, Frostweed’s ice show is always a winner, though that’s not always true where I live in Austin. 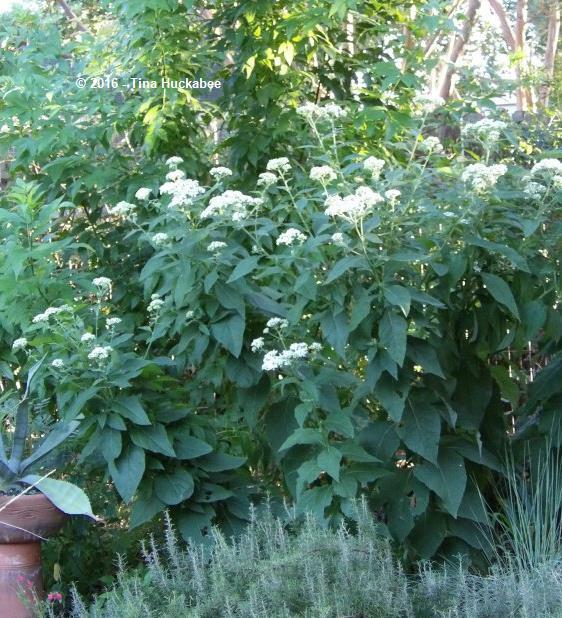 I would also suggest that Frostweed is a casual plant. 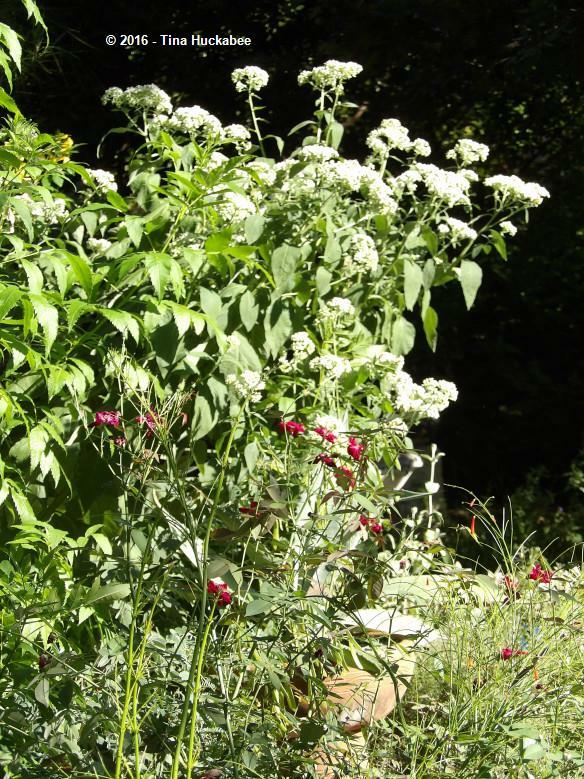 In literature about using Frostweed in the garden, it’s often suggested that it’s best planted in an informal setting or as a transitional plant situated between a cultivated garden and a more natural wildscape. ..and of course, those pretty, pretty blooms. 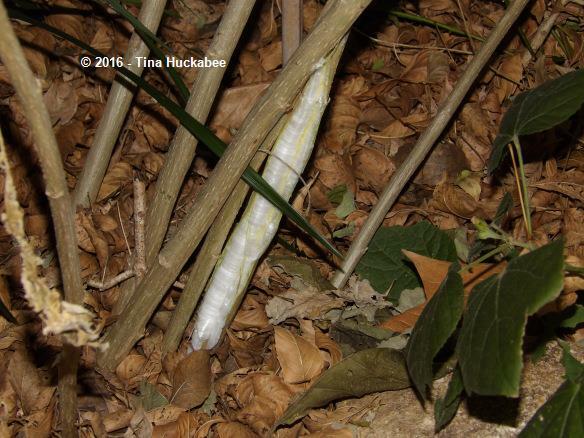 Left to its own devices, Frostweed will create a thicket and that is typically how you’d find it growing in a wild area. It’s deer resistant and needs no irrigation–gosh, the perfect plant! So where do you get this perfect plant? If you’re in or around Austin, I’ve seen it for sale at the LBJ Wildflower Center’s spring/fall plant sale. 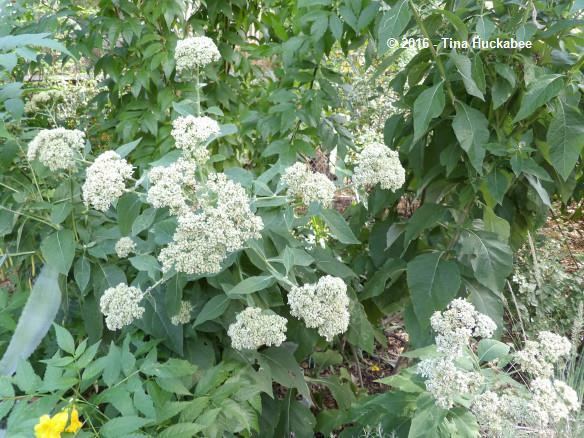 If you live in Frostweed’s native range, check out your locally owned nurseries and if they don’t carry Frostweed plants or seeds, request that they do. 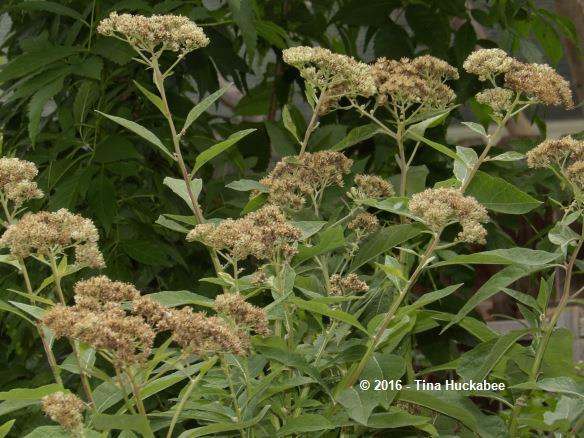 Native American Seed, an online native seed source, carries Frostweed, as well as many other native North American seeds. In my quick Google search on where to buy Frostweed, I noticed that Amazon also carries them, along with everything else. No word though whether a drone would drop off seeds at your house. Best bet? Find a garden buddy who’ll share his/her seeds–and enjoy the results. 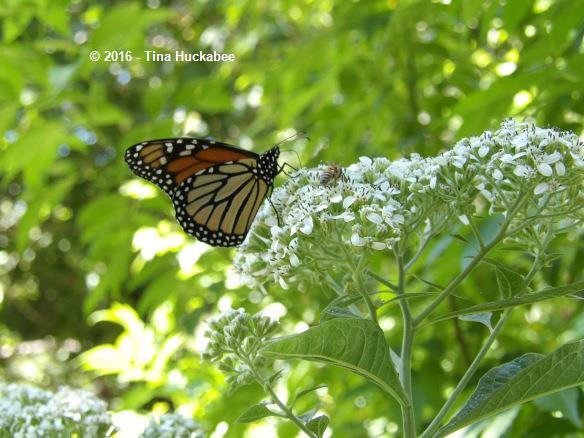 This entry was posted in Frostweed, Uncategorized, Verbesena virginica and tagged A Seasonal Look by Tina. Bookmark the permalink. 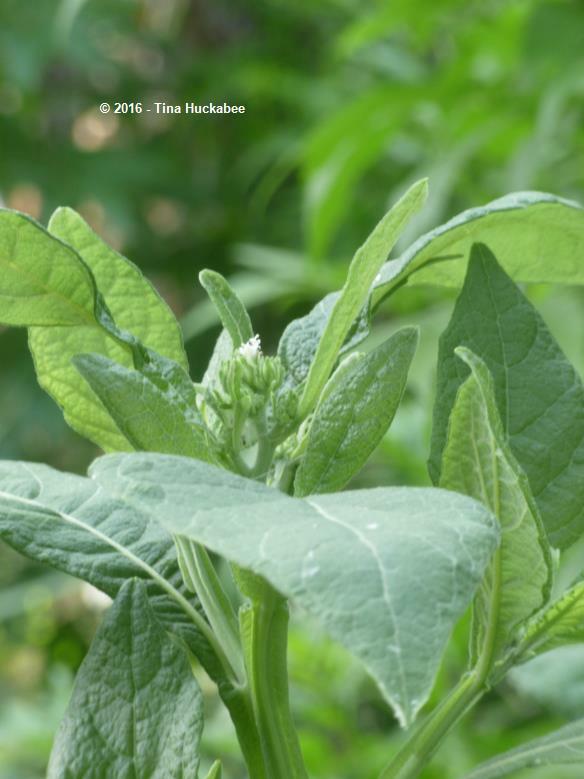 This is a really interesting post Tina, I enjoyed seeing its cycle through the seasons, I’ve just looked Frostweed up here and see another plant name Erigeron philadelphicus is also known as Frostweed and Robin’s Plantain and also from the Aster family, but thats a huge genus. Either way lovely photos from you especially of the Monarch enjoying your plant, I can see why you like it so much. Thanks, Julie. I think there are lots of plants with the name “frostweed”–there are several here, too. 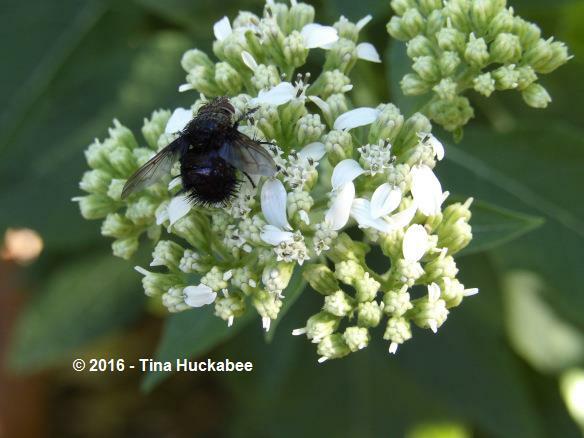 This particular Frostweed is a lovely plant and so attractive to pollinators. 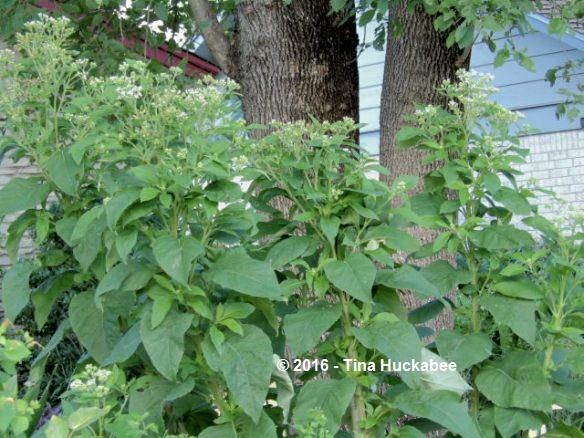 Great information on Frostweed! I’d like to grow it one day…when I have more space. Very interesting on how it pops open in a freeze. Yes, those sculptures are really something. Mine haven’t ever been as elaborate as those I’ve seen in photos. I think that’s because I’ve only grown this plant for about 6 years and our winters are warmer than they used to be. 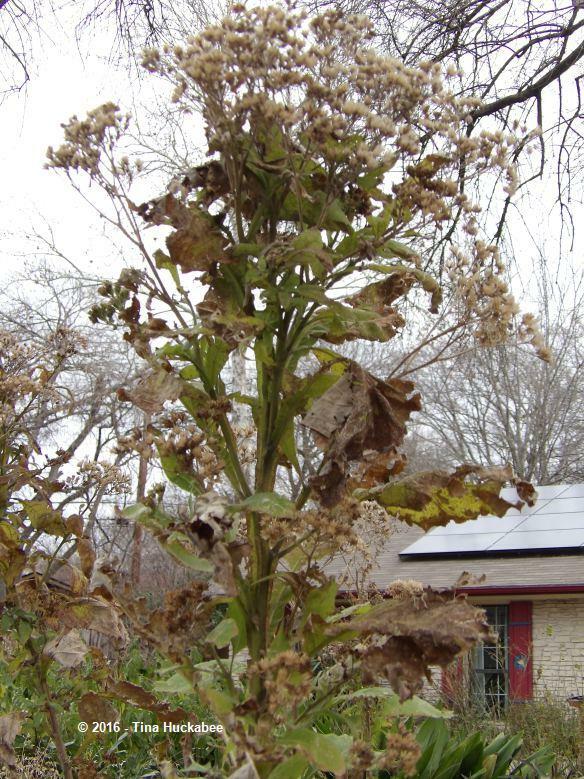 I have a friend whose stand of Frostweed has quite the ice show each winter, but he lives on the outskirts of Austin and gets colder than my house. 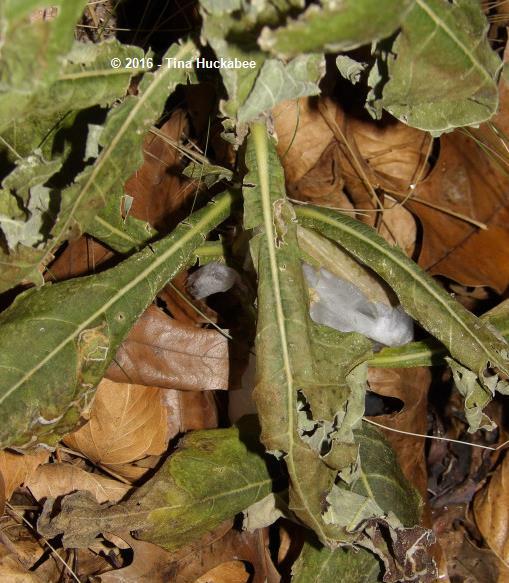 I love frost weed and always try to leave a little in the garden although it has a tendency to become rather invasive. The fall flowers and the show it puts on is worthy of a little invasiveness. Jenny, I’d certainly agree that they can be a bit spready. Last year I had millions (or so it seemed) seedlings. I had to cull down to a couple of handfuls to transplant and share. Still, it’s a worthy plant in beauty and wildlife value. Love how it pops out during the winter season. You can call it an all year round plant. Yup, yup, yup–it’s a great plant!! A beautiful plant, and obviously the butterflies like it! I find the frost flowers in the fall fascinating. I’m a little too far north to grow this plant, so I’ll appreciate it from afar through this excellent post! Looks like my kind of plant! However, sounds like it is not quite hardy in the Chicago area, though I notice it is native to southern Illinois. That’s really fascinating about the sap forming Ice sculptures. You’re probably a bit too far north and too, too cold. I hope you clicked on the LBJ Wildflower Center’s photos–they’re so cool. My Frostweed have never quite put on the show that some do. Great post (love your blog, btw). Quick note/question. 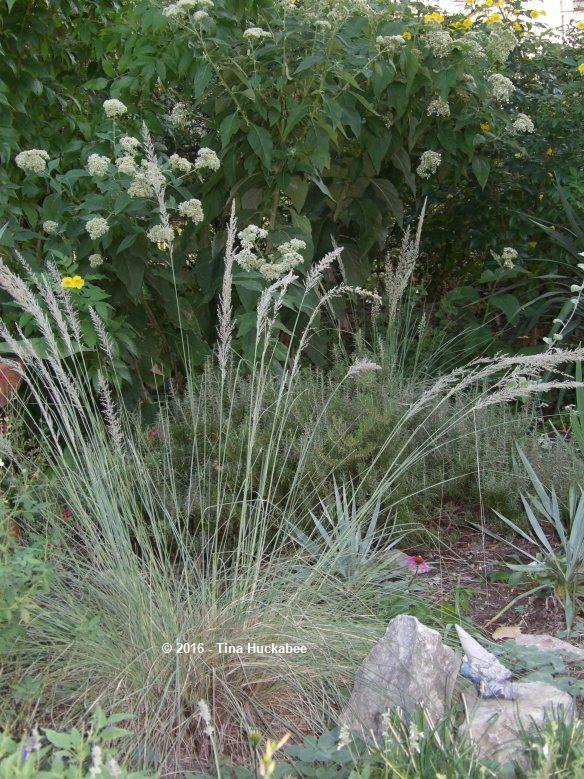 I planted one of my frost weeds too close to a turkscap and v.dentata, so I prune it in early summer and it does not seem to mind it at all. You can actually keep it rather tidy looking. Anyway, some people think this plant is aggressive. I have not had this experience. However, my original plants have all died do to late freezes. The ones I have now volunteered. Is this similar to your experience? It seems to me that this is a plant that you can design with in a fixed sort of way. Instead, this plant seems best suited to those who want a woodland look. The best luck I have had with it is in a big space were v. Dentata, Turks cap, blue mist flower, and heart leaf skullcap (other similar plants would work too) fight it out. Have you had a similar experience with this plant? Do you have long live specimens? If so, what sort of situation are they in? Hi Marcus, thanks for reading!! I think you’re probably right that the Frostweed can be kept on the shorter side. Did it bloom well in fall? My oldest plants are about 5-6 years old. I’ve let them grow large each year, but they do die to the ground most year, except for this one, so far. (I haven’t had more than the slightest of frost this winter.) As far as aggressiveness, they can seed out prolifically. Last year was the worst year for that–more than the others, at least thus far. I ended up hoeing the areas (there were 2) where the seedlings were virtual lawns! Fortunately, neither was a large area to weed up. I saved some seedlings, moved some to other parts of my garden and gave a bunch away. I’m tolerant of seedy, but desirable native plants, not so if they’re not endemic to this region. It sounds like you’ve chosen well in your plantings–all of those plants are excellent! I have not noticed any bloom compromise when I cut them back. 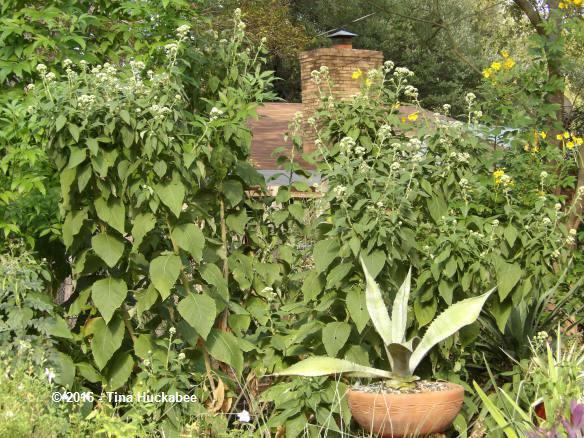 I do it at the same time as I trim back my salvia in early summer. It keeps them at about 4-5 ft when in bloom. I don’t mind them seeding out at all either. I have only had 2 or 3 new ones a year. I’m grateful for the babies, because the parent often dies in our late freezes in waco. Anyway, what sort of situation is your 5-6 yr old plant? It surely has been a weird winter. Nothing has died back really. Grasses are already greening up. Most strange of all, I haphazardly through some purple coneflower seeds in the middle of summer, two germinated immediately, and both of those are going to flower right now! Hi Marcus! That’s good information to know. I’ll experiment this next summer and prune some back that I’d prefer to keep a bit shorter. 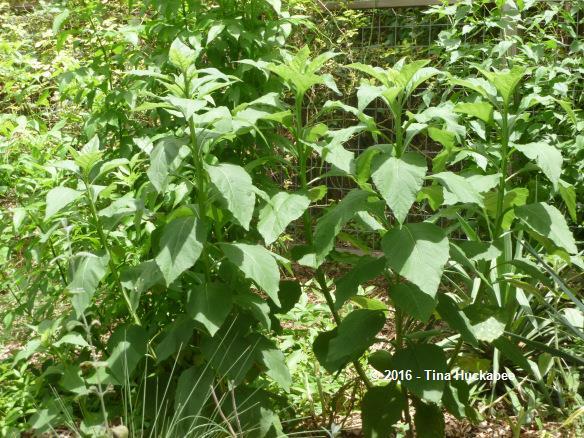 My oldest Frostweed plants get good afternoon summer sun, I’d say from 10:30am to about 4pm, and less than that for the rest of the year. Definitely not a shade plant in that case. 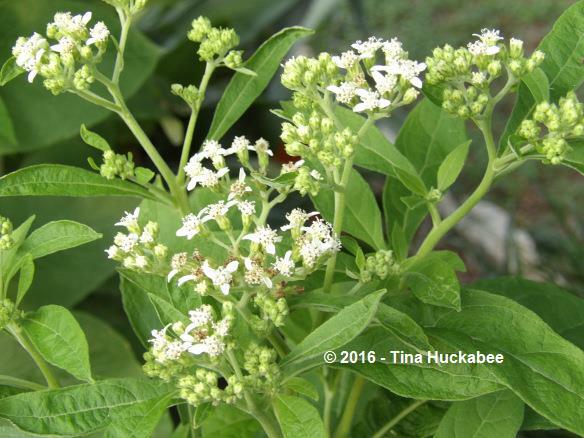 It’s versatile, the Frostweed! I agree that it’s been a weird winter, but I suppose we’d better get used to that. 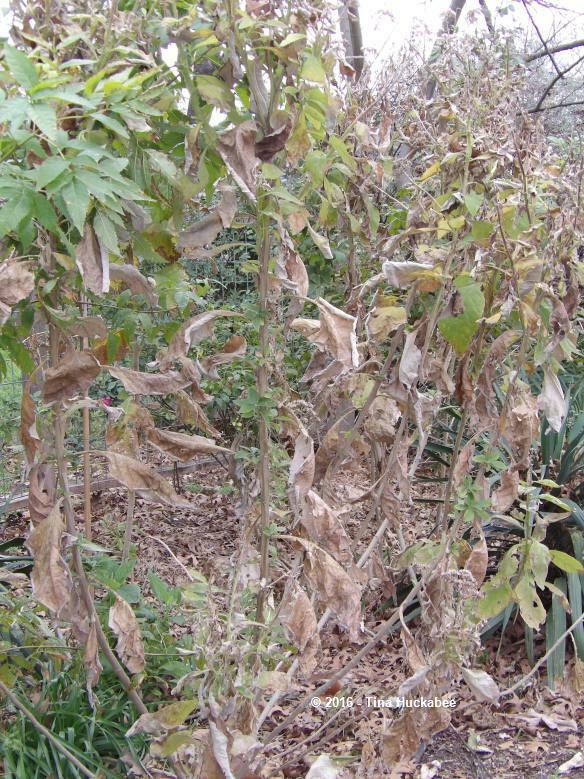 I’ve had only the lightest of freezes–still lots of green on plants that should be completely dormant. 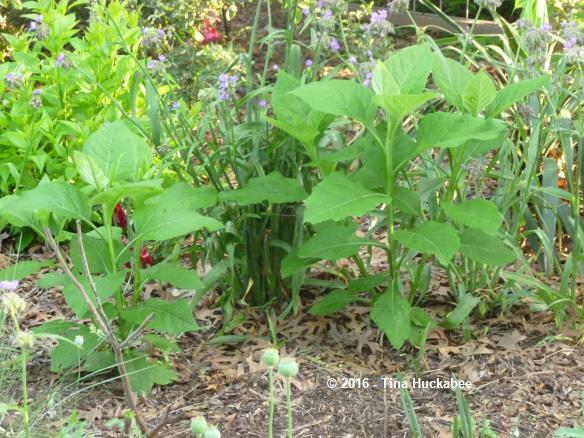 I’m growing frostweed after getting seed from Gail at clay and limestone. I was intrigued by the spectacular frost flowers in her garden and hope to see that here too. Hi Sweetbay! 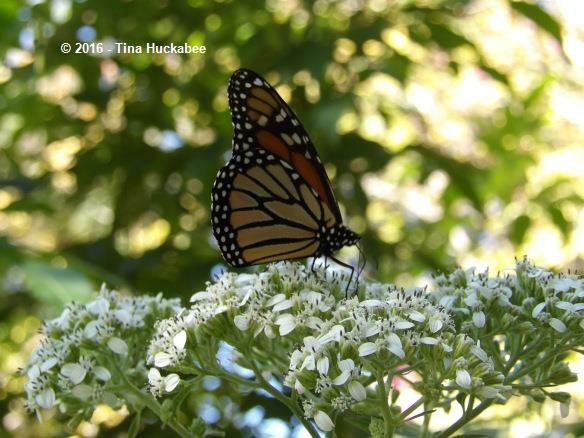 I hope you’ll like the Frostweed as much as I do and that’s the best way to get plants–from a friend!